In an overall financial literacy survey carried out by MasterCard, called the MasterCard’s Index of Financial Literacy, India ranks the lowest in basic money management skills among Asia-Pacific countries( source: Moneylife - Aug 2013). Before we start to manage our monies it is important to understand which stage of life we are in. Broadly the stages are classified Figure 1 above. Once you are aware of the phase you are in you must prioritise and be clear on your financial goals. It is imperative that we plan for all phases well with a goal, while in the accumulation phase plan for now and for the distribution phase. For this we need to do proper financial planning. 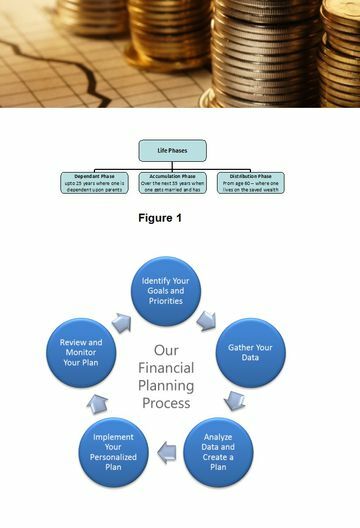 Financial planning is the process of examining one’s personal situation, financial resources, financial objectives and financial problems in a comprehensive manner, developing an integrated plan to utilize the resources to meet objectives and solve problems and monitor the plan performance to take corrective action as necessary to meet the plan projections. Although this may sound daunting, it is nothing but a simple exercise about allocating your monies to achieve future goals. Everybody needs financial planning irrespective of their wealth. 1. Do you know the household budget? Do you have an expense tracker? 2. Do you have emergency savings and if so, how much? 3. Are you aware of your savings and who selects and manages your investments? 4. What are your financial goals and have you planned for them? 5. How have you planned to pass on your financial legacy? Step I - Current financial situation. For this you would need your income details and estimate of expenses (including outflow for EMIs, insurance premiums). The difference in the two will give you the surplus available for investing monthly. You choose products which match your goals. There are many simple products available like fixed deposits, public provident fund, post office schemes, mutual Funds and insurance Products including medical Insurance. Learn the basics of these products. Most importantly, understand the risk associated with each of these investment avenues. The internet is an ocean of information on any of the above subjects. The Indian mutual fund websites have very good articles for investor education. Other websites compare insurance policies. Use these to check on various insurance policies. Attend financial education programs, which help you understand the above from a practical aspect. Some products like PPF can be used for retirement planning and Mutual Fund SIPs can be used to plan for children’s education. It is also important for you to assess your risk taking ability and invest accordingly. For this you must undertake a risk questionnaire. It tells you your ability to take risk- however your willingness to take risk may be higher or lower. But it is important to understand your risk profile and allocate your assets accordingly. Finally, you must regularly review your portfolio. There are many free portfolio trackers available online on which you can upload your portfolio. These trackers give you the returns on each of your investments. At the end of the year, see how much different investments in your portfolio have helped you reach your goal it is a good idea to have a yearly financial audit for this purpose. The audit will also throw up underperforming investments. Hence the plan developed must be flexible in case goals change and provide protection and liquidity easily. Plans must also be tax efficient. You must realise that financial planning is actually a journey of your financial life and the journey fructifies only if you stick to your financial commitments and action out the advice given by planners. Many times, people go through the stage of getting financial plans written but then do not action them out. We have also seen many people confused by multiple page financial plans, so remember to have a one page plan which is actually enough to cover your financial life. Know How much to Save - A 2012 study by the US-based Putnam Research Institute says that the fund selection, asset allocation and portfolio rebalancing do not not impact the final portfolio as much as the quantum of savings. Hence it is very important to start saving at least 40% of your take home. Start Early - Most of us do not think about retirement till our late thirties. The actually planning begins when we are nearing 50 and have just ten odd years to save.